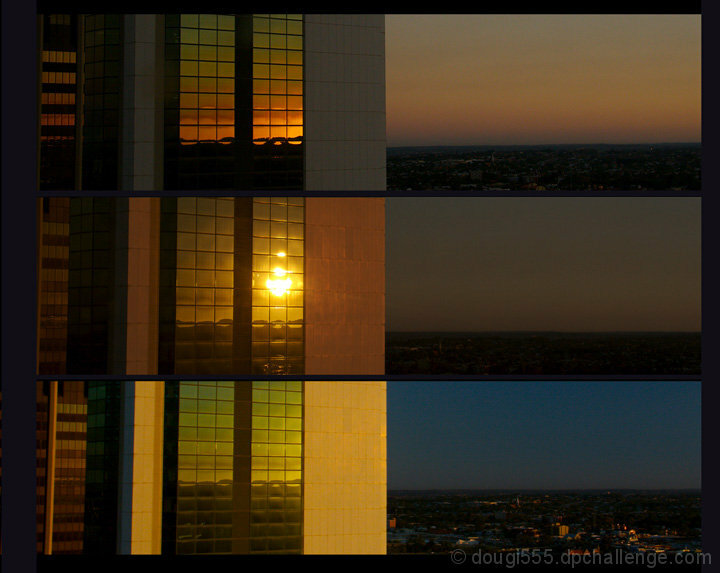 The changing colours as seen from my office window as reflected on the Bank West tower here in Perth Western Australia. THree seperate shots about 15 mins apart, shot in RAW, processed in Apple's Aperture, cropped to align with each other, slight increase in saturation, pulled together in CS2. Greetings from the Critique Club. While the colors in this image are quite striking and it IS interesting to see the three images together; I think the image lacks that dynamic "pop" that DPC voters look for. A strong focal point or more daring composition may have helped your score quite a bit. With such lovely evening light, I think you should play around with shooting different angles and compositions from that spot and see what you can come up with. Now I really thought this would do better. Seems most folk figure the shots needed to line up better - perhaps use a tripod next time. The only thing that annoys me is that is doesn't perfectly line up which in this case I think it should. Rich colours. Great set - Nice idea. Lovely idea, beautiful colours. There seems to be a slight lean to the building which slightly throws the flow off, but altogether very nice. Great idea. I love it. I would have loved to see the different images perfectly aligned with each other. The colors here are just great to create a pleasant mood. I like the idea of the same picture at 3 different times of day. But the arrangement invites comparison in size and positioning and the building lines in the panels don't all match up. Proudly hosted by Sargasso Networks. Current Server Time: 04/18/2019 10:50:42 PM EDT.